GENERAL INFORMATION. The Helike Project is recruiting students and other volunteers to take part in archaeological field work at the Hellenistic, Classical and Early Bronze sites of Helike in Achaia, Greece, during six weeks in the summer of 2004. 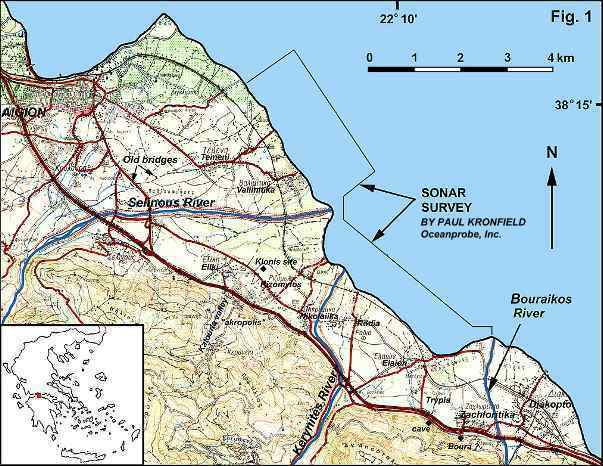 Helike is located on the southwest shore of the Gulf of Corinth, about 7 km southeast of Aigion (see map). The Helike Project is managed by The Ancient Helike Society (Dr. Dora Katsonopoulou, President) and the Geology Department of the University of Patras, with field work under a permit from the Greek Ministry of Culture. BACKGROUND. For information on the history and archaeology of Helike, see the linked article on Discoveries at Ancient Helike by Dora Katsonopoulou and Steven Soter, and references therein. 2004 FIELD SEASON: The Helike Project will accept students and volunteers for a minimum period of two weeks between May 10 and June 18, 2004. The main focus of the field work will be archaeological excavation of the Hellenistic, Classical and Early Bronze Age sites discovered in recent years. We will also use geophysical survey techniques to help map buried ruins in the area. There are no pre-requisites for participation in the expedition. All instruction is by professionals in the field. Volunteers may participate in various phases of the work including excavation, washing potsherds, work in the conservation lab, and geophysical survey, as determined by the Project Director. They are expected to work Monday to Friday, with weekends free for rest or excursions in the region. Participants should prepare by reading on the history of ancient Greece in general and on this region in particular. Weekend excursions may be arranged depending on demand. The Helike Project will issue certificates of participation for volunteers on request. COSTS. Each volunteer will contribute €800 per week of their stay for a standard accommodation with 2 persons per room, or €1100 per week for an individual room. The minimum period is two weeks. This donation to The Helike Society is tax-deductible and covers hotel room, breakfast and dinner for a seven-day week, plus some Helike Project expenses. Payment will be accepted in advance or on arrival in Greece. Should the field season be canceled, the Project will refund the full contribution. MEDICAL. All participants are responsible for their own health and accident insurance and must sign a waiver of liability. They should bring their own supply of sunscreen/block, first aid items (band-aids, Neosporin and Cortisone cream recommended), and any prescription drugs they may need. The Early Bronze Age excavation horizons are in sediments below the water table. The Project provides rubber boots for those working in muddy trenches. We pump out the infiltrating water each day, but boots are still needed. *Most volunteers will also participate in pottery washing and some, depending on experience, may work in the conservation lab or with the geophysical survey team. HOTEL AND MEALS. The volunteers are housed at the Hotel Poseidon Beach, in the village of Nikolaiika. The hotel provides breakfast and dinner seven days a week, pre-paid by the contribution. Volunteers may also eat at nearby tavernas, but at their own expense. The fine pebble beach at Nikolaiika allows opportunity to relax during free time and on weekends. TRANSPORTATION. Volunteers arrange their own transportation to and from Greece. After your acceptance, we will advise you regarding transportation between Athens and Nikolaiika. Openings are limited. We will process applications in the order received, and notify you regarding acceptance as soon as possible. After acceptance, you may send your entire fee, payable to The Helike Society, to the above address. You may also pay upon your arrival in Greece, in euros, dollars, or travelers check only.